Trailhead and parking area are located at the Crawford Depot on Rt. 302, in Carroll, NH. The Crawford Depot is 8.5 miles south of Rt. 3 and just south of the AMC Highland Center. Not too far down the Avalon trail to Mt. Avalon are two small but wonderful cascades. The flat and easy trail begins at the Crawford Depot. Cross the railroad tracks at the Crawford Depot and head out on the Avalon Trail. Pass Mt. Willard Trail on the left in 0.1 miles and cross ledgy Crawford Brook in another 0.1 miles. After a short walk, Cascade Loop turns left and leads back down to the brook and Beecher Cascade immediately comes into view. 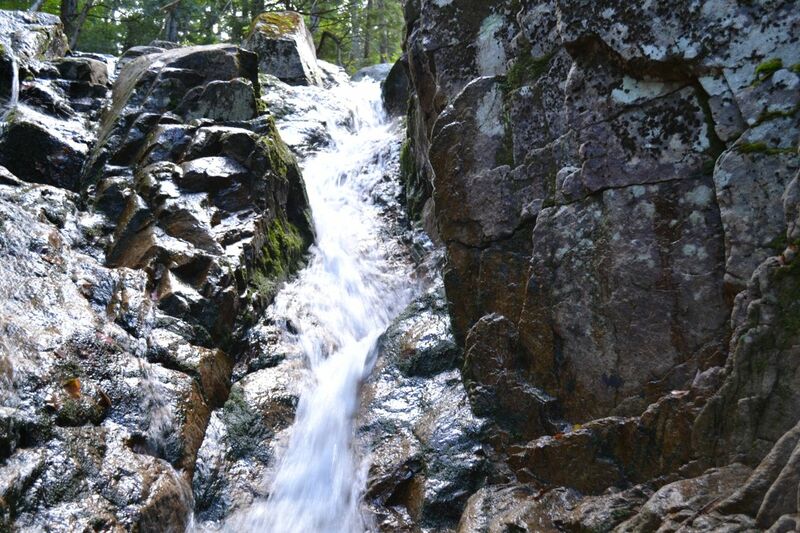 Here, the brook cascades down a narrow chute created by a rock crevice. A few hundred yards up is Pearl Cascade. Pearl is slightly shorter than Beecher, but is much wider. At this cascade, Crawford Brook fans out over a rock slab, which is best viewed during high water.